Blurb in our local paper, the Ridgway Sun. Click on the image to go to the Sun's website. 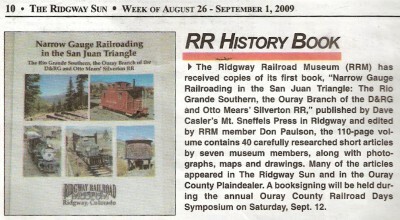 For those following the Ridgway Railroad Museum, here’s a blurb of interest if you happen to be in the area this September 12th. The book has been quite the hit—the museum asked for a reprint because they’re selling them so fast! You can check out their book and order from us by clicking on this link to our catalog. The book is available from us for $19.95 plus S&H. If your shipping address is in Colorado, there is a nominal sales tax.